You have no idea the impact you have on a Wednesday. What you don't know is that your presence has been a calming and reassuring force in our week for years now. No matter how good or how bad our week was, there you were every Wednesday reminding me that we could go on. The weeks I couldn't count on anything, I could count on you, Frank to light up my boy's face. My 4-year-old son, Greyson has autism. Some days it's nearly impossible to get into his world. I still remember the first time he heard and processed the hum of your engine coming down our street. My son who barely speaks said to me, I want truck. You better believe we ran. You broke into his world when I couldn't, and moments spent watching you go down our street together brought him back to me. And almost every week after that first time he asked, I would hold my breath and wait and hope he would ask for you again, I want truck. And so often he did and we would run outside in whatever discombobulated state we were in to see you. I remember Grey started preschool this past fall. I was so sad and not at all ready to let go of my little buddy. I was mournful to say goodbye to our trash truck Wednesdays. And on that first Wednesday morning after the school year began, I heard your hum on our street as we were leaving for school. You came early and we still got to see you. Suddenly I knew we would be okay. Today I heard your melodic engine roar and hum, your brakes squeaking with each stop of your truck. We went outside and waited for you. And Grey's eyes came alive when we finally saw you turn the corner onto our street. And today as you were driving away you abruptly came to a stop, reversed and you opened your door. I see you two out here every week, you said. Do you want to get a really good picture? And you opened your world and your heart and your truck to me and my boy. You have no idea what that moment meant to me. I asked you your name and I shook your hand when I really wanted to grab you and hug you. I tried to hold back my tears. I wanted to tell you everything but all I could do was squeak out thanks. Sometimes I worry- How will the world treat my boys? And today was a beautiful reminder that people are good- all because of you, Frank. I saw the way your face lit up with joy that my son put there and I was so proud and so honored and so humbled to be a part of such a magical moment. Sometimes I hear phrases like People are so stupid, or crazy or mean. To them I say- No they aren't. You haven't met Frank. I am crying just reading this so I can't imagine how you did writing this. Love, Love, Love it. Thanks for sharing Frank with us. This really touched my heart. Thank God for good people like Frank! Love. You are such a wonderful writer and mom. So thankful I found your blog. And thank you to Frank, too for the small act of kindness that made your sweet boy's day! I have two little boys also, 3 and 15 months. They are my world as yours are. Thank you for sharing your story. I just sat here bawling, so so so glad Grey had that amazing special moment. Just beautiful to read this. Bless your hearts! Frank your amazing! I love Frank. That is all. Thank you Frank, for reminding us that People Are Good! We all need to be like Frank! Beautiful. Thank you for starting my day out with that thought. People can be kind. Beautiful. Thank you, Chrissy, for sharing this with us. Thank you, Frank, for being you! What a fabulous wake up read for me today! Thank you for sharing your heart! Maybe I shouldn't read your blog at work any more.... :-) Tears, Chrissy - tears! What a beautiful post. Reading this gave me chills. There is a deep, sweet message this story shares. I am so thankful for Frank. Teary reading this. I have 3 boys, now 10, 14, and 16. But I remember so clearly waiting for the garbage trucks! Please give your letter to Frank. I'm sure it will make his day too! Every morning I cant wait to read your blog! I have followed Momastery for a couple of months and saw your guest post. All of your posts make my heart soo full of love!! I wish the world was full of lots of Franks!! Tears, tears, tears! God love you Frank.....you are one heck of a fellow! I am a grandmother to a 19 year old grandson with autism. While he is high-functioning about a lot of things, he's definitely a challenge. He lives with grandpa and me. I'm so glad to have found your blog. What you go through with Grey and Parker brings back so many memories of our Josh when he was small and undiagnosed. If only I could have known then what I know now. Seeing your life through your blog is making me a much better person and caregiver to our special child. I no longer say "normal" in relation to children; I say "typical." Thanks for what you're doing - and please continue. Frank is a hero to every little boy out there, I wonder if he knows how loved he really is. We have a Frank. We know how important that hum of his truck is. Trash Truck Friday consists of eating breakfast in the back of our truck as we watch Frank go up and down the street. This blog brought tears to my eyes, just like everyone else. I think it's because we all can relate to the relationship that Grey and Frank have... with our own kids. Your blog is inspiring and I share it with everyone. I share at least one quote from you a day. Because you always strike a cord. Because you are a supermom! Because I just love to read about you and I think everyone else should too. I love how real you are. I love that you don't hide the hard stuff in life. I love how you are making people aware, one day at a time. I agree. It should also be sent to Mayor Swearingen and the City Council. Tears in Ohio too. God bless Frank. I am so glad his humble presence in your life has made such a tremendous impact. You just never know what can make someone's hour, day, week, life so much better. LOVE this story. I found your blog through Momastery and I have read it begnning to end and now look forward to your postings every day. You are such a great writer and loving mother. I look forward to reading more. Thank you! I am so glad to have found your blog. thank you. Tears...that's all I've got. But they are shiny, happy tears. WAY TO GO FRANK!!! This brought me to tears! As a super powers teacher for the past 6 years, parents like you are rare. So, thank-you for being willing to share your journey with the world. I look forward to your posts daily! Absolutely wonderful... way to go Frank!!! I hope you have shared this not only with Frank but with his supervisor. What a lesson for all of us. Beautiful! God bless Frank! And you and your beautiful babies! Awww...I think you bring me to tears daily. I just found your blog last week and I like you guys....you make me smile. Prayers for your day. You constantly bring tears to my eyes! I absolutely love reading about your boys. Love this, love to Frank, and love to you and your beautiful boys!! I saw this video on yahoo and it also reminded me that people are good "Pro Surfer Israel Paskowitz Uses His Unique Expertise to Help Autistic Children"
Amazing! After reading this post last night (or early this morning) I took the time to send you an e-mail (a long one). One I have wanted to write since last week when I found your blog. I just hadn't found the time to send it. I was too busy reading your blog. :) Finally last night I just stayed up late to send it to you. It is a bit about our journey as we also have a child with super powers. I really believe your blog will "save" many families and provide hope, courage and stamina for many more. I hope me sharing our journey/story in my e-mail will also give you a little bit of hope and joy knowing that all your hard work will really pay off. We are a little farther along in our journey, as our son is now 8. We had many of the very same struggles. Life is so much brighter now. And, I know your boys will end up doing things you never imagined. You are a wonderful person and I hope you take in all the compliments and feedback. You are making a difference! Tears welling up reading this - just beautiful. I can't tell you how many times one of my kids has yelled "Mooommmmyyyy" and in the split second I could be annoyed by it, I switch to grateful. You have made a positive impact on my daily life just by sharing your story. I thank you and send love your way in return. I was also thinking the other day that perhaps your sons will come up with their own way of communicating with each other and from them you can learn their language. You all may just help make big advancements in autism communication studies. I don't know this for sure but I do know you are changing the world so anything is possible! I am the division manager for the solid waste division and as often as I see the guys, I forget how much they impact the lives of the people we serve. Sometimes we can get wrapped up so much in the day to day that I forget the emotions behind our actions. I will pass the message on to Frank and to you a special thank you expressly from me for reminding me why I come here every day! Very cool story! I have been driving sanitation trucks for 33 years and I never get tired of little kids who love seeing us in our trucks! Children Are The Future. We Have ToTake The Time Out And Let Them Know That They Make a World Of a Difference. We Have To Teach Or Kids Love And Not Hate. We Have To Teach Our Kids About God. We Have To Teach Our Kids That They Can Do Anything They Put Their Minds to. What a wonderful story! God puts angels on the earth for everyone to be reminded of his grace. It is great that you see the good and wonderful spirit in a man that is looked over as apart of everyday life. He however is an apparent big part of your sweet son's life and he did not even know! This gives me goosebump and bring a smile to my face! Everyone looks at old pictures of their now teenage child and misses that preschool version of their child for a minute. But for many parents of children with autism, we see the worst of autism when we look at those pics.... where our kids were more trapped in the prison of confusion and discomfort than they are today. You can see the fear in their eyes in photos at birthday parties, etc. I did not think I missed those years at all. 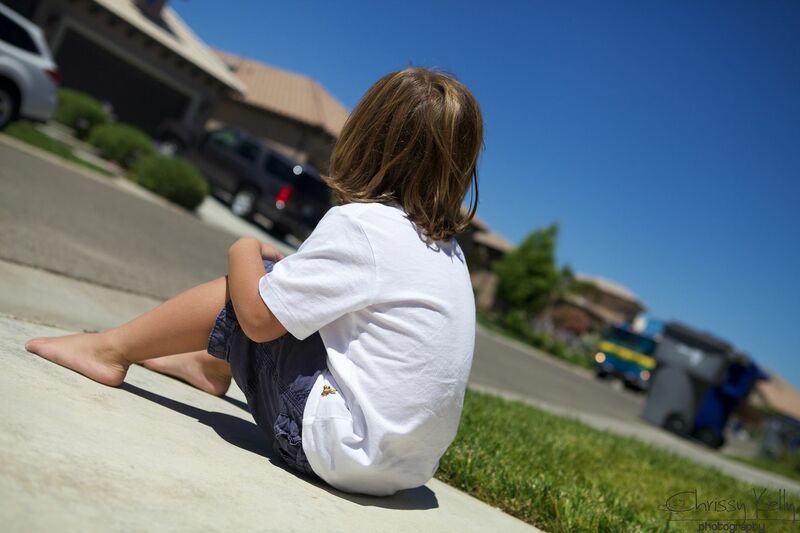 It is indescribably hard to deal with this stage, with the child's challenges, with your own feelings about your child being giving this diagnosis and with people who criticize your parenting rather than believe your child is autistic. But this story today gave me an unexpected gift. It reminded me of that magical time when fire trucks and taxis were some of the only things that brought my child out of his shell. I cannot emphasize enough what a few minutes of human kindness might mean to someone else. Thanks for sharing. I have tears as well as I read this. Thank God for man like Frank. I know how much this meant to you Chrissy, as I have had my ups and downs sorting through my son's Asperger's. If only more people in this world would take the time to educate themselves, before saying something they may regret. Thank you for sharing this.....teared up reading it!! It just reminds me that my daughter isn't facing autism alone. Thank you for sharing this. Isn't it wonderful that there are people like Frank in the world? WoW.....thanks for sharing, going to share with as many as I can. My son who has autism had a similar experince when we lived in KY. In such crazy, hectic,chaotic time, its good to know people are so caring!!!! I am trying to write this with tears in my eyes.I haven't read such a heartfelt story in a long time. there are still good people in this world and I'm so happy that people like Frank are on this earth ! I have a Grandson with Autism, not as severe as your sons but it is hard sometimesbecause people don't care about how to communicate with him.I hope that there will be many more people like Frank in your sons life! Wow, My son is also four and is also autistic. This really touched my heart. We need more Franks in this world. That touched my heart. Just saw your story on the Nightly News - I have two sons aged 10 and 11 with autism. My oldest was not speaking at 4 years old although he would echo - I will never forget the first time I asked him a question and he answered 'yes' rather than repeating - Your story brought it all back - hugs to you, it's difficult but rewarding. For us, things have gotten much better as time goes on. When my son was diagnosed, the doctor pretty much wrote him off as going nowhere - Now, he is at the top of his class and even helps other students. We are confident he will do well in life. Best of luck to you and your family! Beautiful story of simple compassion making a world of difference - it means so very much to us mamas of special boys! Been there, am there and will be there for as long as I can. My two sons have severe autism and are now 22 and 21. Your family will make it for the long haul if you keep your amazing joy. Humor and joy is what keeps us together while we have watched other families dealing with autism splinter. Stay strong but remember to take breaks from the stress and emotions. Another thank you to Frank and to Chrissy for writing is a way most wouldn't understand, but do here. Autism speaks! Hugs to you and your special but ordinary family. I love this story. Your sons are beautiful. I have a 6 year old boy named Luke. He is also on the autism spectrum. 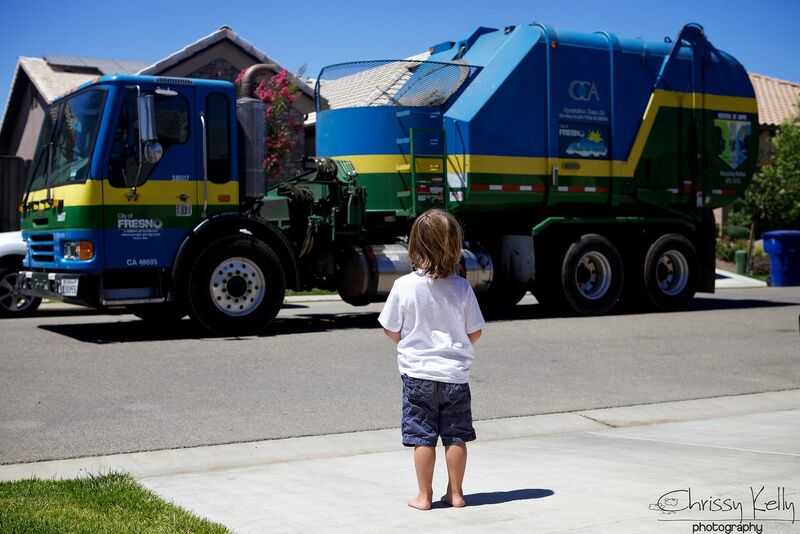 When he was two he didn't speak much at all but he always mentioned the trash truck when he would hear it a street away, and enjoyed watching it pass by very much. I love your overall attitude and writing style. I really enjoy coming to your blog and reading your posts. Also on a side note your son might really like the book Smash Mash Crash, There goes the trash!, if you don't already own it.♥ Stacy I hope you continue to share your stories for a long time. Just read this....I wish Frank (maybe he does by now) could know this...its so inspiring. Praise God for the ways he blesses us with relationships! I just came across your post via Handmade Home. What a great story! My brother has autism (he's almost 35 now!) and he too has always LOVED garbage trucks. 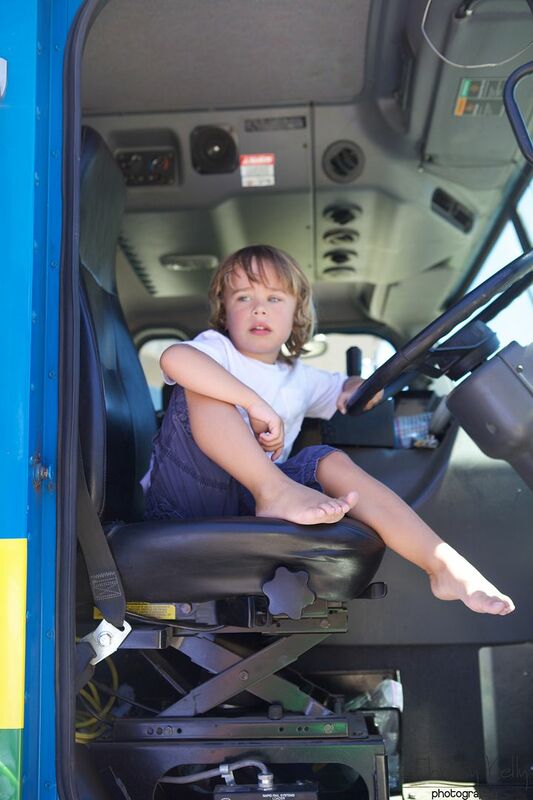 We were visiting my sisters in NY (we live in OR) and had a similiar experience with a garbage truck driver who was super nice and asked my brother if he wanted to sit in the truck so we could get a picture. It's so great to have those interactions! Gotta love those garbage truck drivers!! I'm a 61 year old grandfather of 2 gorgeous girls and I don't mind telling you I was tearing up reading this post, but that's not the point of my comment here. Reading this bittersweet story of yours I was reminded of an old country tune called "Teddy Bear' by a relic of a country singer by the name of Red Sovine. Beautiful, everybody needs a Frank in their life sometime! Prayers for your boys, your family and Frank ! I had tears rolling down my eyes... I believe God comes in forms to give us hope and he did in the form of Frank. Thank u fr giving hope to move forward. This brought tears to my eyes. My almost 3 year old grandson was just diagnosed a couple of months ago, he is my ray of light. ❤️ God bless your beautiful family. Looking forward to following your story.